A little backstory for those who don’t know, the Kangoo is Renault’s smallest offering, and it directly competes with compact vans, such as the Ford Transit Connect and the Nissan NV200, with the exception of the smaller Compact model, that competes with smaller vans such as the Ford Transit Courier and the Fiat Fiorino. I personally love the idea of single van competing in two different size classes, but I am also a weirdo who likes the styling of the Jeep Patriot. The Kangoo is currently in it’s facelifted second generation, but is very long in the tooth, as it first came out in 2007, with no replacement in sight. But that’s on par with most vans, as they’re rarely refreshed. (Riveting stuff I know). (left to right) Kangoo Express Compact, Kangoo Express and Kangoo Express Maxi. 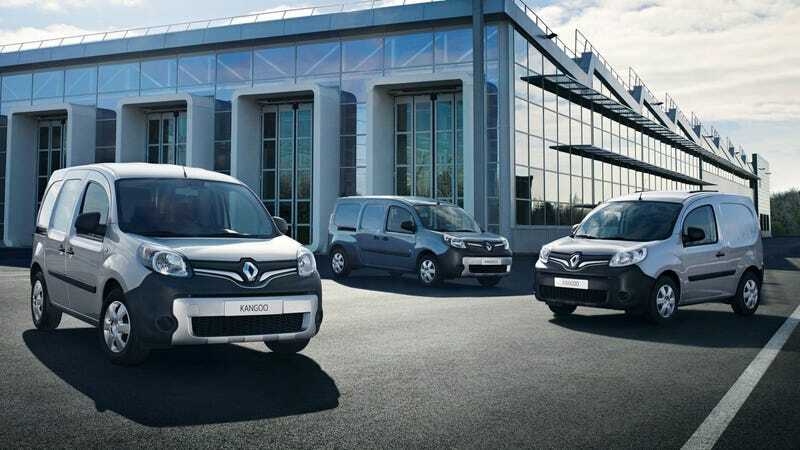 The Kangoo is available in a panel van, called the Kangoo Express, in three different size, while the passenger version is confusingly just called Kangoo. The passenger version doesn’t have a compact counterpart (anymore). Unfortunately for me, the compact and passenger versions were all killed in the great Renault UK Extinction event of 2011, which killed half it’s UK lineup. OK, the readership numbers have now dropped to 3, so I must get a move on. So that plant pot you bought was a bit taller than you expected? With the Giraffon (Giraffe hatch), you can finally fit your replica Tiki column in your van, so it creepily stares at other motorists with it’s six faces. It actually originated as an option on the 1962 Renault 4 Fourgonnette, and has somehow survived to modern day vans. Usually super cool features like this are killed when they find out nobody uses it, so kudos. Yes, despite the small size, Renault managed to fit 3 abreast seating up front, complete with nifty features like turning into a table for things like a laptop, so you can get work done at a traffic jam, such as spending way too much time typing up an Opposite Lock post that 3 people will read. I’m amazed at how they pulled this of on such a small vehicle. Although it seems like the middle passengers legroom is the centre console. Yikes. Also unfortunate is the lack of ability to get this front bench on the passenger version, so my dreams of transporting 8 people in this van are gone. Does anyone actually buy OEM child seats? Seat patterns are cool but will forever remind me of public transport. Although standard for this type of vehicle, but a point I can’t emphasise enough, 3 equal size seats in the second row! The middle person doesn’t have to get the hump! I don’t know of a single CUV or SUV that has this. Another point how MPVs, LAVs and Minivans are superior. What do you mean you don’t give no shits about 3 row seating? No come back! Huh, I guess we’re down to 2 readers. Now this feature is genius, even if I’m pretty salty that I had this idea before I realised it was already done. (my version involved a pass-through to a front trunk through the glovebox). Most of the time, there’s only a single driver, and there is valuable space taken up by a seat that’s rarely used. So just fold down that seat, and swing the bulkhead, and you now have room to carry your a second Tiki, so it’s 7 faces are staring at you while you drive. I think there’s a couple other vans that do this, but the whole super clever bulkhead thing seems Renault exclusive. So you ordered the crew van, with a second row of seats, but now you need extra space? To be honest, I don’t find this particularly interesting, but Renault was one of the first manufactures to recognise the need for electric vehicles, coming out with four models all the way back in 2011-2012. the Kangoo Z.E. was pretty much the first mainstream electric van to come out, and makes up the vast majority of electric van sales in Europe. Once again the poor compact model got the shaft for electrification. I myself care more about one of Renault’s other electric vans. Well, that part on the current market share of electric European commercial vehicles was enough to put one of my 2 readers to sleep. So my single reader, you will be the only one to truly know about the full wonders of the Renault Kangoo. Enter enlightenment with me. Yes, you can get this van as a Mercedes-Benz Citan. Mercedes obviously doesn’t rebadge vehicles often, but heres an example. It’s not a straight rebadge, as Mercedes has taken the time to redesign the dashboard and “improve refinement”, but that wont stop Joe from bragging to his coworkers, how he just picked up a fancy new Mercedes, only to get laughed at when they tell him he overpaid for a Renault. And for some reason you can get compact and passenger version in the UK. Remember when I said that they don’t sell a passenger version of the Compact Kangoo anymore. * Well because that’s what this is! If you said no, it can’t possibly be because you’ve skim read this super long boring article, while wondering why the hell the writer is fascinated so much with some boring van. Yes you single reader. Feast your pupils on this glorious vehicle. 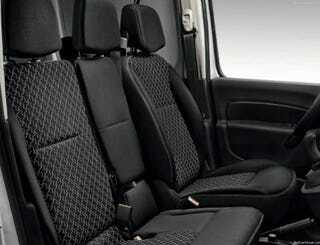 The Renault Kangoo Be Bop! What a name! The giraffe flap has been re-purposed as a sort of sunroof (it also has a regular one up front), complete with wind down rear window. This creates pretty much a convertible at the back, akin to the 2 door SUV convertibles of yore. Why are these so cool, but the Murano and Evoque not? Renault clearly wanted in on one of the coolest vehicle segments, And they chose one of their best/worse cars for the job. Complete with the funkiest interior and that amazing two-tone paint. Unsurprisingly, like those convertible SUVs, demand was so high, that they killed it due to poor sales. My single reader has now keeled over in disgust, his sarcasm detector reading negative, before collapsing on his keyboard, dead.